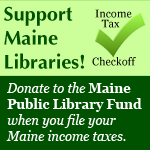 Vassalboro Public Library : 59th Annual Book & Bake Sale and 10th Annual Silent Auction! 59th Annual Book & Bake Sale and 10th Annual Silent Auction! Click on the link above marked "Annual Sales and Silent Auction" for updated information, including a list of donors and items for our 10th annual Silent Auction. The Silent Auction begins on Monday August 27th at the library. We currently have 47 items up for bid and will be adding more! The Book Sale will be Friday Sept. 7th from 7-8 pm (Preview Night, must be a Member of the Vassalboro Public Library Association - $10 fee, may join at the door) Saturday, Sept. 8th from 9 am to 3 pm with delicious homemade goodies at our Bake Sale and Sunday, Sept. 9th from 10 am to 1 pm, A Buck A Bag - limit of 10 bags per person.